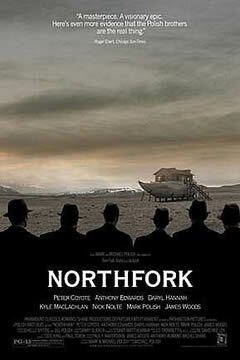 Written and directed by brothers Mark and Michael Polish, Northfork is the kind of movie I adore; a film that introduces fantasy into a realistic setting while simultaneously balancing elements of comedy and drama. Whether you want to laugh, cry, or simply be amazed, you’ll find what you’re looking for in this film. It’s 1955, and the good citizens of Northfork are being asked to abandon their homes to make way for a new hydroelectric dam, which, once operational, will flood the entire area. Yet, despite repeated warnings, not everyone has left town. So, it's up to a small group of men (all dressed in black) to clear out Northfork before the waters arrive. Among those trying to convince the stragglers to leave are Walter O’Brien (James Woods) and his son, Willis (Mark Polish), who volunteer their time in exchange for a prime tract of land in a new community. But the job won't be an easy one, seeing as many of those remaining are determined to stay put. Father Harlan (Nick Nolte) is one such resident, still in Northfork because he's caring for a dying boy named Irwin (Duel Farnes). But as Father Harlan discovered a while back, Irwin is a very special child, one worthy of such a sacrifice. As he lapses in and out of consciousness, young Irwin experiences visions which have him convinced he’s the long-lost Angel of Northfork. In fact, a small band of real angels has just arrived in town, tasked with investigating whether or not Irwin’s ‘divine’ revelations are the real deal. Northfork weaves plenty of drama into the mix, both on a grand scale (the death of the town) and a more personal one (the illness of young Irwin), elements that, by themselves, make it an unforgettable motion picture. But there are laughs as well, generated by the men in black during their run-ins with the most stubborn of Northfork’s population. Mr. Stalling (Marshall Bell) feels he’s prepared himself for the coming flood waters by turning his house into an Ark, and while he didn’t have time to gather 2 giraffes, 2 tigers, or even 2 chickens, he was able to rustle himself up two wives (Saralyn Sebern and Ginny Watts). Yet what I found most impressive about Northfork were its moments of pure fantasy, as related in the story of Irwin and his four angelic visitors. One of the four, an angel named Flower Hercules (Daryl Hannah), believes Irwin is telling the truth, while her accomplices, Cup of Tea (Robin Sachs) and Happy (Anthony Edwards), still have their doubts (the fourth, played by Ben Foster, never speaks). The imagery found in these sequences is nothing short of astounding, challenging us to accept the incredible, even when presented within the context of a very real world. With Northfork, the brothers Polish have successfully merged the fantastic with the everyday, often leaving us guessing where one ends and the other begins. With the possibility of something marvelous lurking around every corner, Northfork is a film to savor from start to finish, and I, for one, loved it.